When you are on the move, whether coming off of a screen, cutting away from the basketball, or going towards the basketball, you want to learn to turn 90 degrees. This will allow you to shoot an optimally balanced and controlled shot. Sidenote…This 90-degree rule applies to any position on the court, except when your back is to the basket. Now let’s talk about what a balanced and controlled shot is. 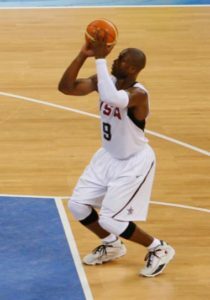 The balance portion refers to a shot where your hands and body are in a loaded position, allowing you to spring up and shoot a one-motion shot. During the load phase, you have to “find your feet.” You do this by ensuring your feet are underneath your body after every movement. After every 90-degree turn, you need to check to make sure your feet are underneath you so you are always balanced. The control portion refers to speed. Once you have mastered the balance portion of your shot, you can move onto practicing control. Control helps with the space-time repetition, which is what helps you convert your shot to game speed. This is what you practice for…to ensure your control shows up when you need it in the game. So how do you practice the 90-degree turn? You turn sideways to the basket with your feet facing the sideline. You spin the ball out; once the ball comes back to you, quickly turn 90 degrees to the basket in the load position and spring up to shoot. You can add variations such as shot fake, add one dribble, go between your legs, etc. Have fun with it! In conclusion, mastering 90-degree turns will teach you the proper footwork and positioning for optimal shooting performance coming off screens to catch and shoot. Master these and be a threat to any opponent!